Christmas is our favorite time of year at Erik HOMEMADE(R)! We love the sights sounds and smells...and of course the fabrics! We seem to generate a lot of scraps in the holiday theme making what we make...and we can never get enough, let alone part with the scraps! After the popularity of our Scrap Pile Mystery Quilt project, several of our readers asked if we were planning another mystery. 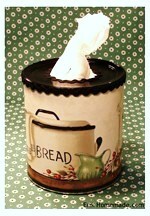 We had thought about it and originally decided that we would tackle a block-of-the-month mystery for late spring 2011. Yet the questions kept coming...all while we were working on our Christmas projects. So the idea came forward that we should give a Holiday mystery a go. After finishing the Scrap Pile project, we could easily follow into Christmas. We chose a design that would be easy to cut and suitable for all skill levels; would use basic colors that most people have, or could get any time of the year, and most of all use scraps! The binding is cut, the basting is done...all that is needed is to finish the quilt! There is plenty of room to embellish with your favorite things! Buttons? Pinecones? Candy Canes? It is now up to you...! If you are just joining our Christmas 2010 Mystery Quilt project, this is the final installment of the mystery instructions! We will post our final thoughts on the project and the instructions will remain on our website indefinately! You may find all of the instructions and other posts relating to this project by clicking on the Ornament photo button under the title DON'T MISS A STEP. If you have further questions or need help please contact Erik HOMEMADE(R)! Now to get the quilt ready for quilting; easy as layer, baste, and quilt as desired...then bind! Once the quilt is quilted, you can add the dimentional applique' on page 27! We will post a full picture of the quilt on 11 April when our quilt comes back from the quilter! 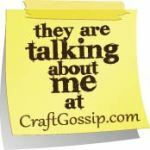 Once the quilting is done, add this dimensional applique' to add a little interest to your quilt, if you like! Christmas 2010 Mystery Quilt Contest! Now that we are almost finished posting our Christmas 2010 Mystery Quilt, it is time to see what everyone has made! And to add a little fun, we are having a contest! The rules are easy: send us a photo via email to weblog (at) erikhomemade (dot) com of your finished quilt and we will enter your name for our random drawing to win a state-of-the-art Gingher Seam Ripper! You must be a FEEDBURNER(tm) subscriber, over the age of 21, and, although we always welcome photographs from our readers around the world, you must be a resident of the USA to win. All of the photos we receive will be posted in a new photo album on the left side of our Main/Home Page so that everyone may enjoy them. 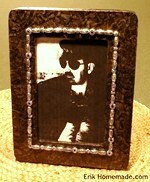 To give you time to get your quilts finished, you have until October 1st, 2011 to submit your photos! For more information, click on our Contest Button. The outer border is added this week! Use whatever print you have enough of...diagonally piece the strips like we did. Next week we will show the dimensional applique' to add a little interest! See you then! If you are just joining our Christmas 2010 Mystery Quilt project, we are almost finished! If you need to print copies of any of the instructions posted so far, click on the DON'T MISS A STEP ornament photo button on the right side side of our Main/Home Page. There you will find an entire listing of the pages posted to date. If you need more help or further instructions, please contact Erik HOMEMADE(R)! Add another border using red scraps this week! Your left over Step 17 strips will give you a head-start...make another set to blend with the rest! We are almost done...see you again next week! If you are just joining our Christmas 2010 Mystery Quilt project, there are only a few more posts left before we finish! If you need to print copies of any of the instructions posted so far, click on the DON'T MISS A STEP ornament photo button on the right side of our Main/Home Page. There you will find an entire listing of the pages posted to date. If you need more help or further instructions, please contact Erik HOMEMADE(R)! This week we add the inner border! Use 1/3 yard, or make it scrappy green...it is up to you! We are almost done with the quilt top; see you again next week...you will need your reds! If you are just joining our Christmas 2010 Mystery Quilt project, or have fallen behind, there are just a few more instruction steps until we finish posting. If you need to print copies of any of the instructions posted so far, click on the DON'T MISS A STEP ornament photo button on the right side of our Main/Home Page. There you will find an entire listing of the pages posted to date. If you need more help or further instructions, please contact Erik HOMEMADE(R) by any means listed on our Write Us Page! This week we put the center field together! The quilt is not finished yet...we have borders left to make, as well as a little dimensional applique (if you like!) When we are done posting the entire project, we will show you a picture of the quilt! See you next week! If you are just joining our Christmas 2010 Mystery Quilt project, there are only a couple of more posts to go until we are finished posting! If you need to print copies of any of the instructions posted so far, click on the DON'T MISS A STEP ornament photo button on the right side of our Main/Home Page. There you will find all of the instructions posted to date. If you need more help or further instructions, please contact Erik HOMEMADE(R)! Here is row O! Make this row just like the rest...pressing in the direction of the arrows. Save your left over red striped squares for an extra project we will add at the end! See you next week! If you are just joining our Christmas 2010 Mystery Quilt project, there are just a few more weeks until we finish posting! If you need to print copies of any of the instructions posted so far, click on the DON'T MISS A STEP ornament photo button on the right side of our Main/Home Page. There you will find an entire listing of the pages posted to date. If you need more help or further instructions, please contact Erik HOMEMADE(R)! Use one red-green striped square and one red-beige/white stripe square to make row L! Do not worry...there is more red in the border! See you again next week! 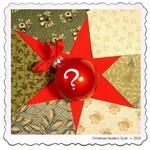 If you are just joining our Christmas 2010 Mystery Quilt project, there are a few more weeks until we finish posting! If you need to print copies of any of the instructions posted so far, click on the DON'T MISS A STEP ornament photo button on the right side of our Main/Home page. There you will find an entire listing of the pages posted to date. If you need more help or further instructions, Please contact Erik HOMEMADE(R)!